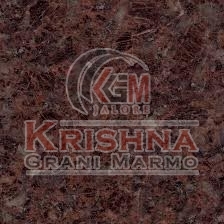 We are a celebrated Manufacturer and Supplier of Coffee Brown Granite Stone based in Rajasthan. Our Coffee Brown Granite Stone is available in deep shades of brown. It is a rich textured granite stone ideal for application in kitchen countertops, bathroom countertops and many more. The elegant brown granite stone is processed with complete care with the latest machines. Its immaculate finish brings shine and color to the maximum. Coffee Brown Granite Stone is available in custom dimensions to meet diverse requirements.